FeX for Facebook is a simple iPhone utility which enables Facebook users to sync some data between their Facebook account and their iPhone. FeX, which stands for The Friend Exchange, is a convenient way to transfer data about your Facebook friends back to your iPhone’s contacts. Find a Friend: Launch FeX, and the utility will scan your list of Facebook friends, looking to sync birthdates and profile pictures with your iPhone contacts list. The $2 app from CocoaMotion allows you to sync two pieces of data—and just two—between Facebook and your contacts list—birthdays and profile pictures. Why only two pieces of data? FeX is prohibited from syncing other data, such as phone numbers and e-mail addresses, by the Facebook’s terms of service agreement. Anyone looking for a quick one-step tool to sync their Facebook friends with their iPhone contacts will find FeX useful. After you give FeX permission to access your Facebook account, FeX scans your list of Facebook friends, automatically matching anyone whose name also appears in your iPhone’s contacts. The program displays a tiny thumbnail of your friend’s default Facebook photo along with tiny icons to indicate which data the program will sync back to your iPhone. Some users have not listed their birthday and FeX shows you this by leaving the space next to their photo blank. When I first tried FeX, the program recognized 51 of my Facebook friends and their corresponding iPhone contact cards immediately. The automated process of scanning and matching took about a minute. FeX checks for name-to-name matches so the program was unable to recognize friends that use nicknames or middle names. 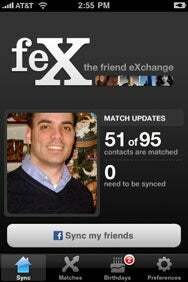 Still, FeX was able to match all but two or three of my contacts—an impressive number. Each time you launch FeX, the program scans your Facebook friends list for new additions. You can quickly review the existing matches—or remove any if need to—by tapping the matches tab at the bottom of the screen. You can also quickly add a new contact entry for any of your Facebook friends from this screen as well. FeX also offers a birthday timeline for all of your contacts and friends on a birthdays tab. The timeline is similar to the list available on the Facebook website. FeX is a simple utility but a useful one for anyone looking to migrate select data from their Facebook account to their iPhone. Though the program is somewhat limited by the Facebook terms of service, FeX is still an easy way to add information with minimal effort. FeX is compatible with any iPhone or iPod touch running the iPhone 2.2 software update.